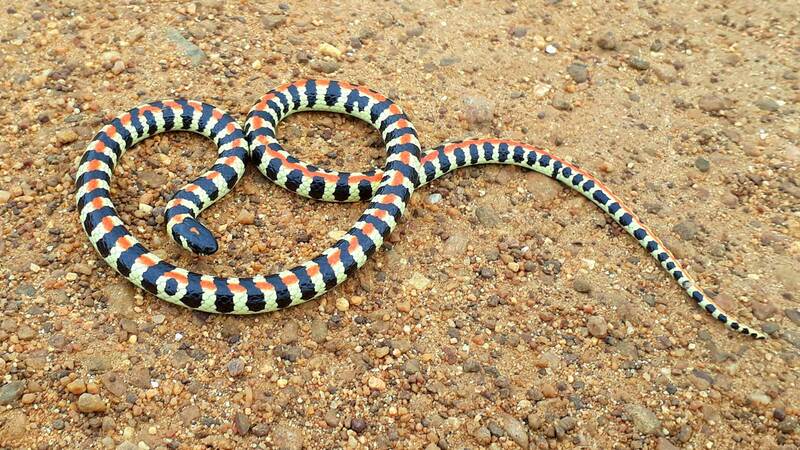 ABOVE: This gorgeous creature is a Spotted Harlequin Snake, Homoroselaps lacteus. Not considered dangerous…gmph. Finally, some rain on the West Coast. 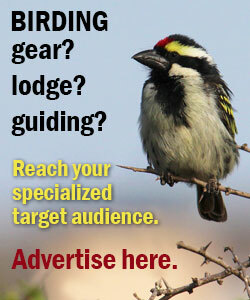 For someone interested in reptiles and amphibians, this means there is some good herping to be had! 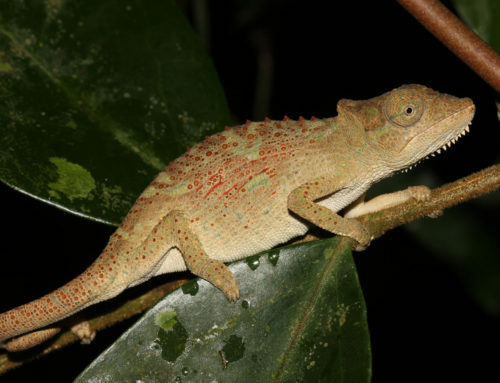 If you’re wondering what “herping” means – see my explanation on herping lingo for definitions. My friend Nick Schaller and I had enjoyed some good fossicking around Langebaan, with Western Dwarf Chameleons, Sand Rain Frogs and even a way-out-of-range Arum Lily Reed Frog. 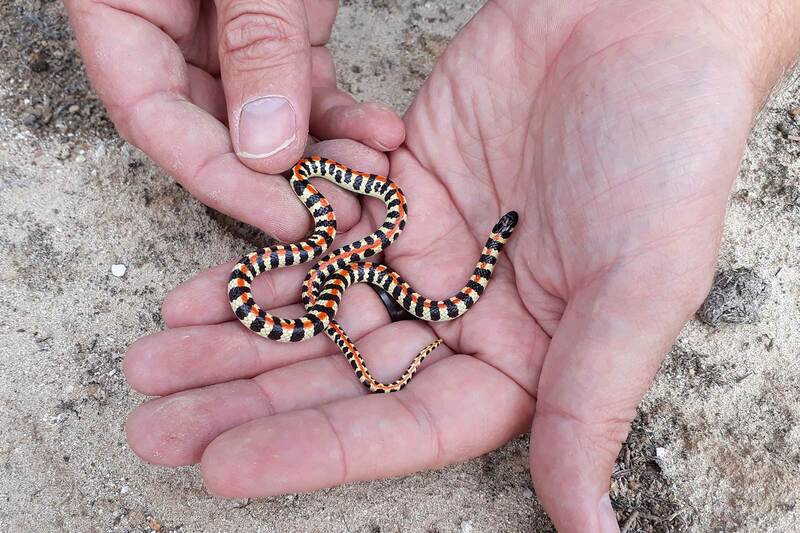 Nick also happened to mention that he found some harlequin snakes in the West Coast National Park. As a partly fossorial species, Harlequin Snakes are often easier to find after rains, and I headed out that afternoon to go and find one for myself. This was easier done than said, and within seconds I found a stunningly colourful individual under a rock just outside Langebaan town. I was ecstatic! 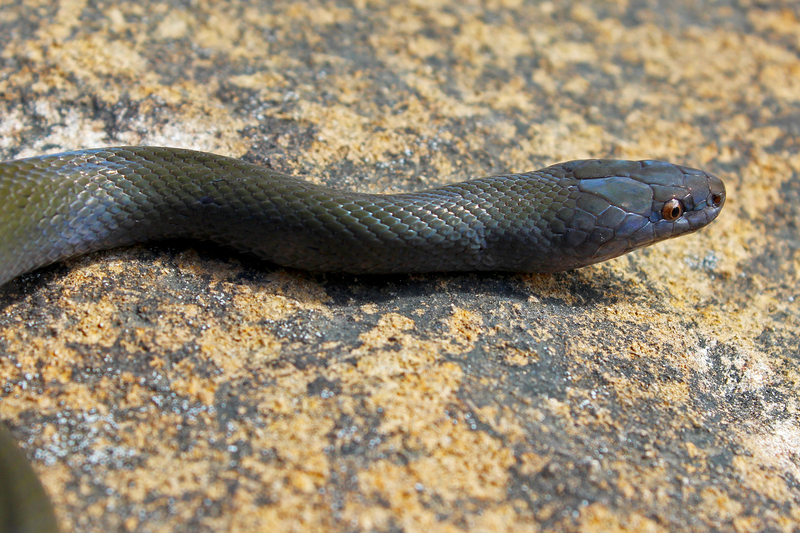 I had never seen one before, and this is arguably the most attractive of all South Africa’s snakes. The species exhibits incredible variation in terms of their colours and markings, with many combinations of yellow black and red, each more beautiful than the last. West Coast harlequins are typically yellow, with broad black crossbars along the entire length of the body, accentuated by a red spine. Harlequin Snakes are described as only mildly venomous, and I have never heard of any serious bites or effects from this species. So it didn’t really cross my mind that I might soon be making a contribution to our knowledge of the venom of this species, when I reached out to pick it up. 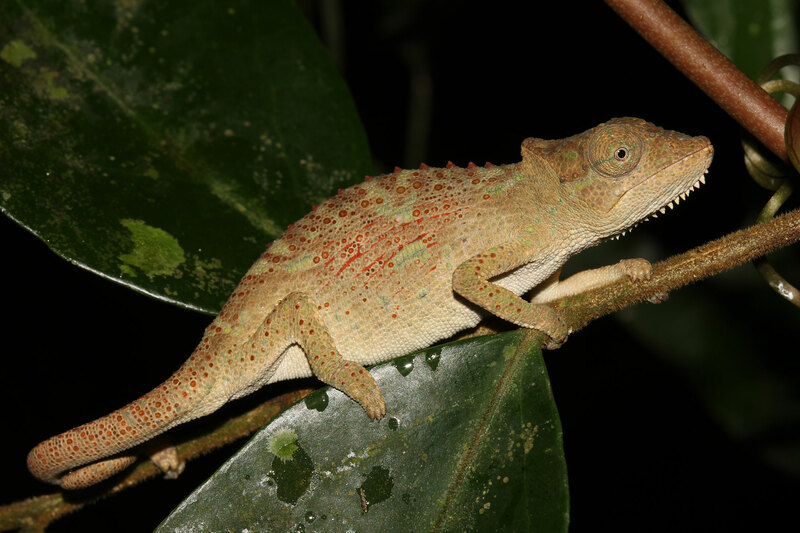 It was about 25 cm in length (probably a sub-adult; 30-40 is typical for an adult; max length 65 cm). True to form, the snake was very docile while I got some pictures of it. It made some rapid, jerky movements and tried to slither away speedily, but it did pose well for a minute or two. I then picked it up to release it back under its rock, and noticed a very slight stinging sensation on my hand. Looking down, I discovered this little guy chewing away at the soft flesh between my left thumb and forefinger. It seemed to be having some trouble latching on, given its small head and narrow gape, and it briefly released me and then went in for another sort of slow-motion strike. I did not want to yank the snake off, in fear of hurting it, so I just let it chew away. I figured that the venom would not affect me to any great extent, and that at least the snake would get some closure. It released, and I released it, and it returned to its rupicolous refuge. But this is where the story gets a little more interesting. ABOVE: This was about 6 hours after the bite. You can see the small red area around the puncture marks towards the top, and a little bit of general swelling around the base of my thumb. ABOVE: 16 hours after the bite (the next morning). The swelling has increased significantly, with the outside of my hand looking very pudgy. You can also see a little bit of bruising forming in the pores. ABOVE: 32 hours after the bite (the next night). The swelling is still increasing, but slowly. However, there was now a lot of bruising visible on my palm, extending all around my hand. The bite marks are a little inflamed. ABOVE: 32 hours. 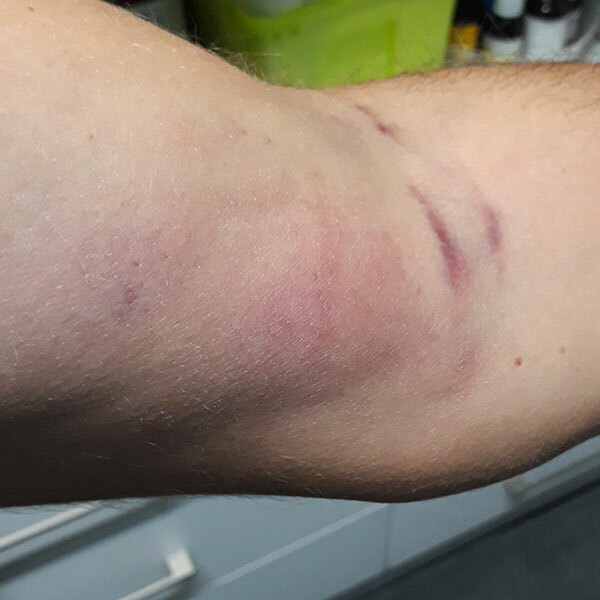 A little more concering, was that the effects of the venom had now traveled up to my elbow and bicep, causing severe stiffness and a consequent lack of mobility. At this point I took some painkillers. ABOVE: 41 hours after the bite. There was now a continuous angry red band from my hand to armpit. The bruising on my hand had spread across most of my palm. My finger joints were quite painful. I couldn’t open olive jars. ABOVE: 65 hours (2,5 days) after the bite. At this point my wife and friends’ urging that I go see a doctor started to sound like a reasonable idea. The main problem now was that I couldn’t really use my fingers or bend my arm. Fun. 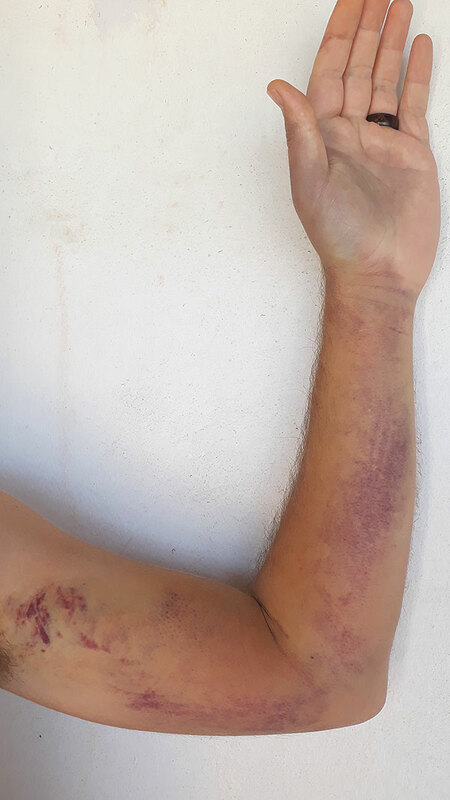 ABOVE: 4 days after the bite. Not much change from the last day or two; perhaps a little bit more bruising. But the pain was quite bearable at this point, and it made for some badass photos. 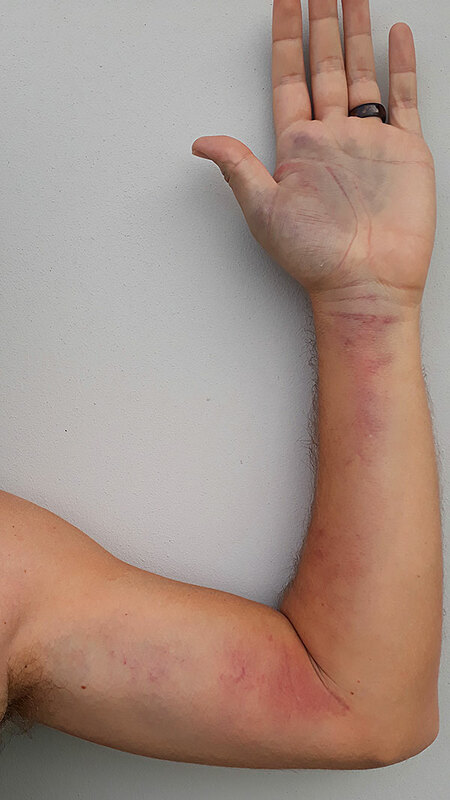 ABOVE: 6 days after the bite. It still looks bad, but it feels much better. The swelling has largely subsided, mobility is increasing, and the stiffness is essentially gone. You can see the bruises have started turning yellow – gross! My sincere apologies for all these gory photos, but hey, it’s science. In summary, these were the symptoms. The bite itself was relatively painless; just a slight stinging sensation, and not surprising given the tiny fangs of the snake. Much less noticeable than an injection needle, for example. Following immediately (for the next 10 minutes or so), was a feeling reminiscent of a bee-sting, but perhaps less intense. The area around the bite became a little warmer and redder, and started swelling. Approximately 6-10 hours after the bite, the swelling was still restricted to my hand, but was fairly intense. The initial pain had subsided, but a stiffness associated with the swelling was noticeable. 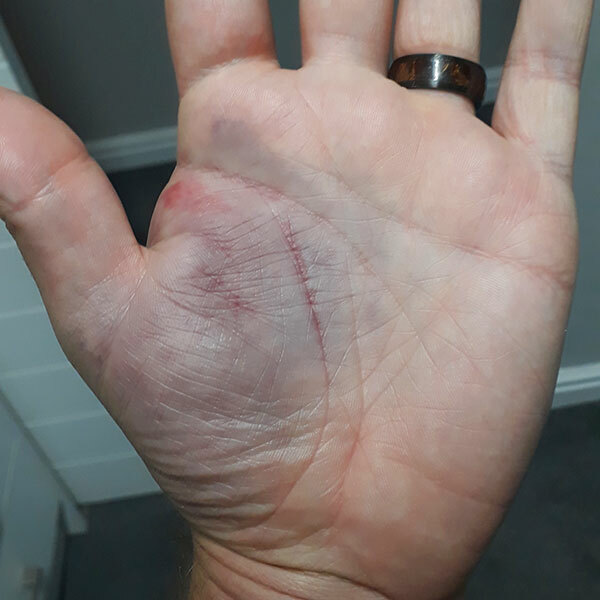 A small amount of subcutaneous haemorrhaging (bruising) was apparent on my palm. For the next 3 days, the swelling on my hand increased slowly, but it never really spread further up my arm. My hand was comically pudgy and stiff however. After that, it stabilized and gradually subsided. 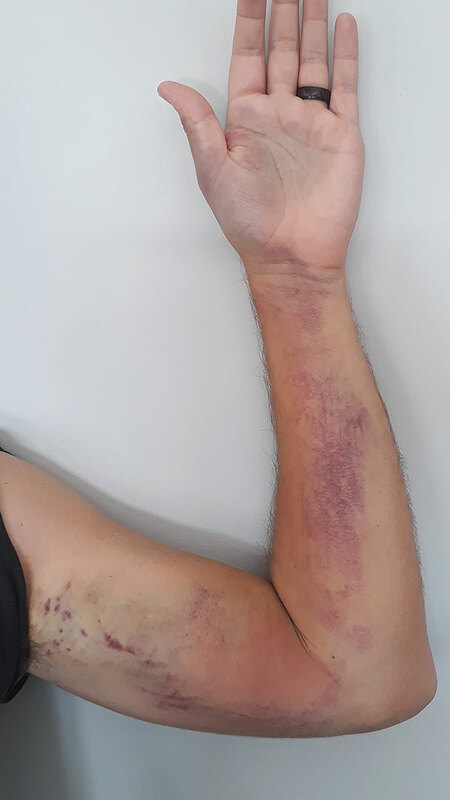 Starting about 2 days after the bite, and worsening rapidly, was a feeling of tenderness in my tendons and joints, particularly of my elbow and fingers. Pain was particularly intense when rotating my arm counter clock-wise. I had very little power in my arm, and struggled to lift anything sizeable. The pain in my finger joints meant that I was glad it was my left hand that was affected, otherwise writing, brushing teeth and further herping would have been difficult. After about 4 days, the pain in my hand was only apparent when I made a fist and squeezed it closed hard – definitely ebbing. For at least a week, there was quite severe haemorrhaging along my entire arm, concentrated in some areas to form blue-black markings. There was no significant pain associated with this though. 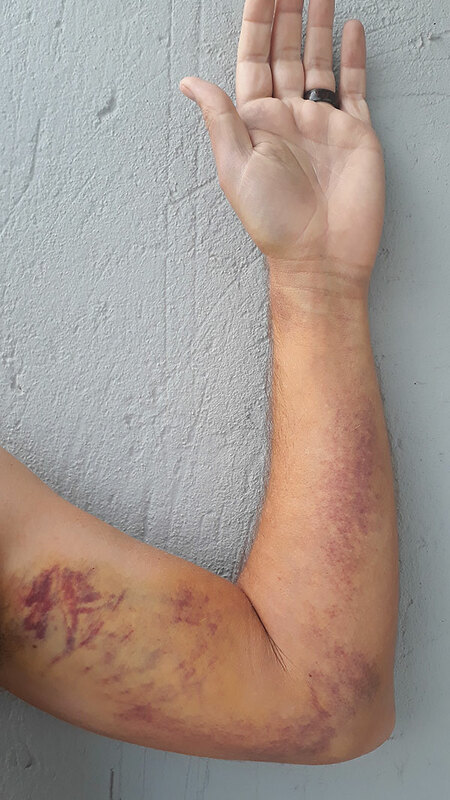 This bruising is now hardly noticeable, about 2 weeks after the bite. My friend James Harvey is a fellow harlequin-bite-survivor. His reported symptoms are almost identical to mine, although it sounds like he had less severe bruising, and perhaps more painful axillary glands. Headaches and general fatigue have been reported, but I cannot say that I experienced this. I did learn from this experience: it’s always a good idea to pick up snakes with your non-dominant hand. Just in case. ABOVE: I guess what doesn’t kill you, makes you wiser. Still, I’ll definitely never forget my first sighting of a Spotted Harlequin Snake! Thanks for post Faansie !! Many years ago my brother and I were playing in leafy terrain , he was bitten on finger but a juvenile Puff Adder !!! He was very ill needles to say !! Your posts are always info filled and inspiring !! Glad I haven’t yet had to document the effects of the feared Death Slug! Thanks for the comments Joe. Sounds like its comparable to the allergic reaction some people get from a Western Hog. 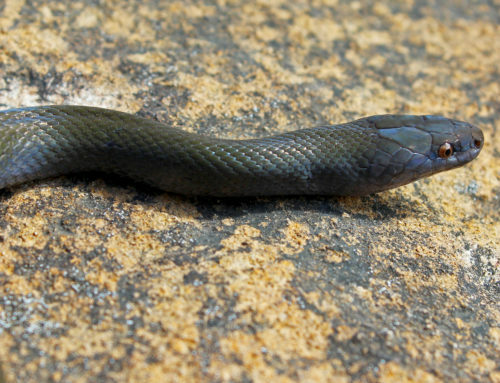 I have heard some reports of the same Tyler, as well as gardener snakes! I have seen photo documented diary of them as well and it seems that once someone starts to freak out and pushes the person to see a doctor it’s at its worst point and symptoms decline from there. Mild venom can still affect you 😉 just not as bad as a very hot snake 😛 It seems those that are allergic or sensitive, unbeknownst to them, have these unexpected reactions. Yet, more and more as far as hognose and harlequin I am thinking these are the reactions to expect as these accounts seem to become more documented. I am curious if the bottom picture is an adult (so tiny). Hi Amanda. Yeah, my wife was also suggesting I go and see a doctor, but to be honest, it looked worse than it felt. It just took a long time for the bruising to subside. No, the snake was a juvenile. sorry to hear about your bite! The classification as “not considered dangerous” for Homoroselaps lacteus is outdated, there are a few bite reports that suggest it may actually be potentially dangerous. I documented this on my website snakedatabase.org. 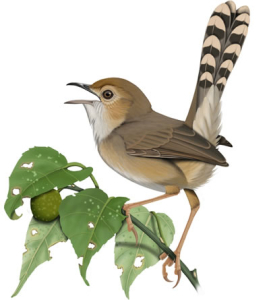 Just look up the species there and you will get full references for toxicity classification. Hi Sascha – thanks for this! A most useful resource. Yes, one wonders what the reaction would be in children for example. Anyways, thanks for the info. Nah, I didn’t deem it necessary to go to a doctor. I don’t think antivenom would be required in such a case. Just treat the symptoms as and when they arise. Dit was ‘n baie dapper ding om te doen maar baie leersaam! Wees net meer versigtig wanneer jy weer so iets doen! Ons wil jou nie verloor nie! Ek weet nie van dapper nie…maar dankie vir die boodskap Mike! 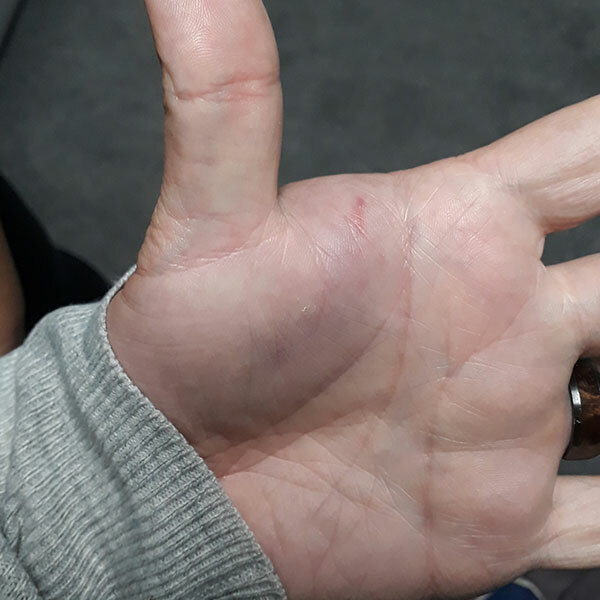 Bly jy is OK. Vir andere wat die blog lees, as so iets gebeur, haal jou ring af – jou hand kan so swel dat jou vinger se bloedtoevoer afsny. Maar dankie vir die blog, en baie dankie vir die kinderboek!!! I’m surprised you kept the ring on your finger, would have been unpleasant if the swelling trapped the ring…. Thank you for your invaluable contribution to science. I have free handled many a harlequin without being bitten. Just lucky I guess. I have always said that there is a fine line between brave and stupid, and as a fellow herper, I think we are perpetually dancing along that line. Speedy recovery and please keep sharing your findings. Would be interested to see if there are any long term affects, both positive and negative. Hi Tanya – couldn’t have put it better myself! No long term effects that I am aware of. I am being a bit more careful with Harlequins though! Good luck but never took the ring off!!! Hi Emilio. 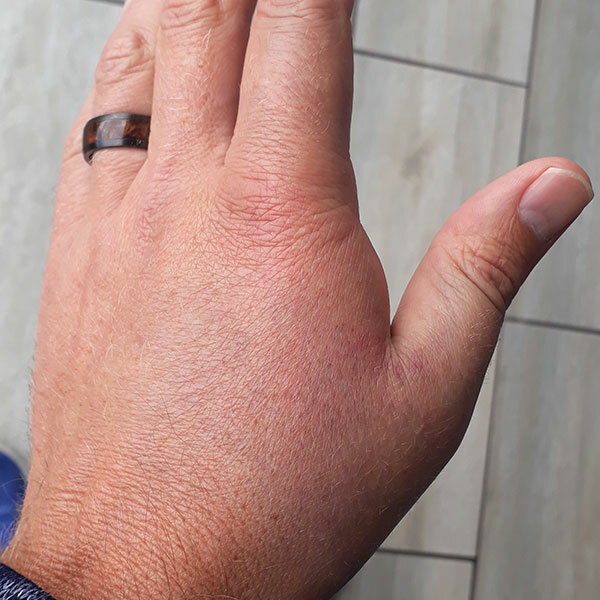 I had to weigh up the risk of the swelling trapping the ring on my finger, or facing the wrath of my wife by taking my wedding ring off! No, in honesty, the swelling was very mild and contained, and I monitored it constantly. I would have taken the ring off if I felt it was an issue. But it is good advice nevertheless.